The Premier Bride Magazine is a proud sponsor at the University Center at the University of North Florida is the longest running bridal show in Northeast Florida. Since 1994 a bridal expo has taken place in its halls and ballrooms. This show has proven to be the premier wedding event in Jacksonville with 100 wedding vendors representing over 17 different wedding categories. Brides, grooms and their entourages have the opportunity to meet their potential wedding vendors, see their work first hand, taste their food or cakes, smell and see their floral displays, hear musicians play, talk to wedding coordinators, gather information on honeymoons, and so much more. Each bride that walks through the door gets a swag bag full of goodies. The bag is also helpful in gathering information from all of the local wedding vendors. The Jacksonville bridal show is also a great opportunity to win prizes and give-away from the Jacksonville wedding vendors. Almost all of the bridal show vendors have a prize to be won. In order to win prizes you have to register to win. A helpful bridal show tip is to create a label sheet with you contact information on each label. Be sure to include your; Name, Address, Phone Number, Wedding Date, and Email Address. Simply peeling and sticking a label is much easier then hand writing out the registration forms. Another helpful tip for the Jacksonville bridal expo is to make a list to types of wedding vendors you would like to see. It is unlikely you can talk to everyone at the show. This all depends on where you are in the wedding planning process. If you are just starting you want to see all of the wedding venues, bridal attire stores, wedding photographers , DJ’s, invitations and cake bakers or sweets. Remember you need a wedding date and location to book most of your wedding vendors. If you are in the middle stages of your wedding planning process talk to; florists, décor and rental companies, caterers, transportation and limos, videographers, wedding makeup artists, officiates, ceremony musicians and grooms attire. And if you are at the end of your process check out; honeymoons, wedding registries, bachelor and bachelorette parties, rehearsal dinner locations, bridal accessories, photo booths, accommodations for guests and all the vendors that help make married life easier! As you can see, no matter what stage you are in the wedding planning process there is something for everyone at the expo! Our Jacksonville shows happen every winter and summer, typically in January or February and September each year so plan on coming twice! 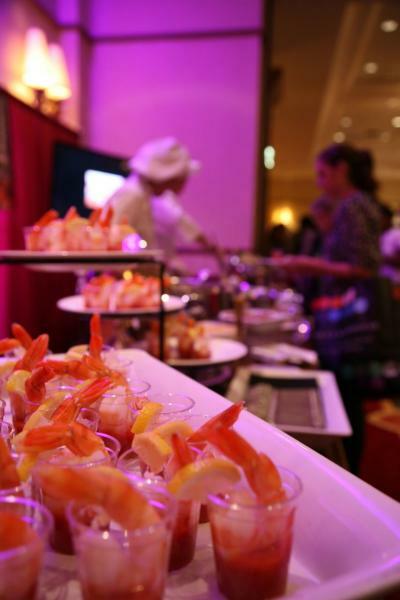 When attending the bridal show you will be pleased to find excellent caterers. A bridal show is a great way meet and taste test the caterer you might plan on hiring for your wedding day, rehearsal dinner, bridal shower or any other wedding related event or celebration. Here are the caterers in Jacksonville we can recommend; Davoli’s Catering, Anthony’s Gourmet Catering, The Capital Grille, Black Tie Catering and Events, d’Vine Cuisine, A Vision Events, and PJ’s Catering. Caterers in Southern Georgia; Southern Soul Catering, Straton Hall Events, and King and Prince Beach Resort. Keep in mind that many reception venues also offer off-site catering too! A professionally catered meal can be the crowning glory of your wedding celebration, so choose your caterer with care. 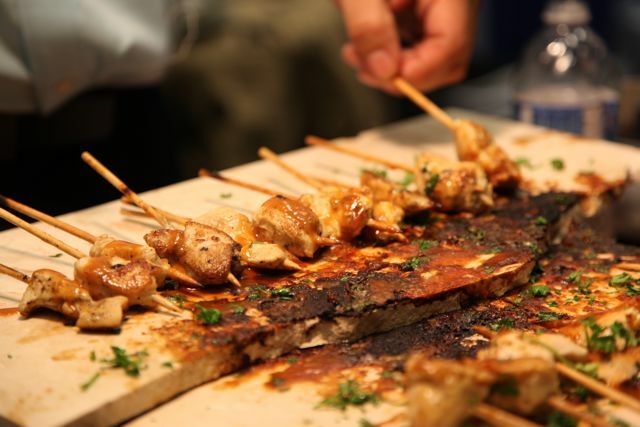 If you want to hire a caterer, make sure you book a reception venue that allows outside catering. Many reception venues keep their catering in-house so be prepared to ask those questions depending on your preference. Here are the wedding reception venues in Jacksonville that allow outside catering; Jacksonville Marriott, Diamond D Ranch, River Cruise Annabelle Lee, River Cruise Lady St. Johns, The Keeler Property, Jacksonville Zoo and Gardens, Suwannee Weddings, Cummer Museum, The Downtown Library, Ribault Club and In the Garden. Here are the wedding reception venues in St. Augustine that allow outside catering; Ponte Vedra Concert Hall, River House, and the Lightner Museum. Here are the wedding reception venues in Amelia Island that allow outside catering; Ocean Club of Amelia, The Golf Club of Amelia Island and The Mansion. Here are the wedding reception venues in Southern Georgia that allow outside catering; Horse Stamp Inn and The Club at Osprey Cove. Most restaurants and hotels will have to use their catering service. Some facilities will include catering charges in the rental cost, and some won’t. Know the score before you book and always comparison shop. Many good private catering concerns will cater meals at any location. As you investigate these possibilities, determine what extras are included in their charges: table linens, plates, glasses, crystal, silverware and service pieces. While these are usually included, it is something you will want to confirm in advance, not find out on your wedding day. Also ask the caterer if they have a alcohol license and can provide the bar services at your wedding. Almost all caterers can generally work within any reasonable, agreed-upon budget. Determine your food budget by deciding how much you will spend on each person. Simply multiply the cost per person by the number of guests. Get in writing which menu and the number of guests your money will cover. Then mentally add an additional 10 percent for overage and 15 to 20 percent for a gratuity, if appropriate. Your caterer will know, from formulas and experience, how much of each item to allow per person. 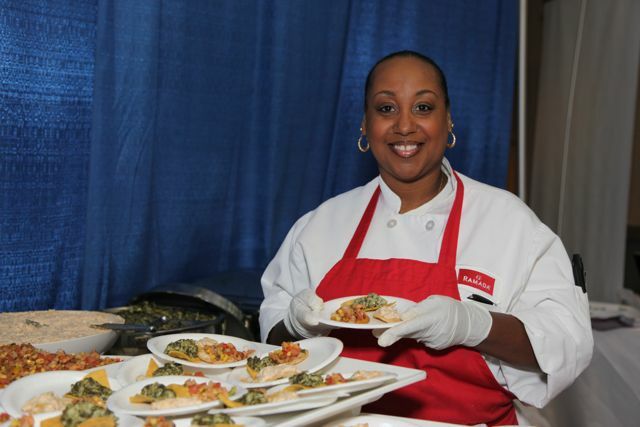 As you visit the different caterers we have at the show, taste test their food, set up a consultation and ask questions! Wedding invitations can set the tone for the wedding! They are the first experience your guest is going to have with your wedding day. Putting in some extra thought and creativity can wow your guests! Luckily at the bridal shows Premier Bride or Jacksonville has sponsored – we have some fantastic Invitations and Stationary vendors. If your wedding is in Jacksonville or St. Augustine; check out Kouture Kreations, Pineapple Post, Impressions or Cadeau. Belted and bedazzled. Dress up your invites with a belt or sash, wrapped around the middle. Use a dramatic black & white damask-patterned sash or a sheer metallic ribbon for an elegant, formal look, or a vibrant grosgrain ribbon with a brass buckle for a playful, unique touch. Think about the theme of your wedding and use a fabric or a print that is a reflection of it. Add a small jewel or charm to the top of the invite for a little extra sparkle and interest. Special delivery. Consider surprising a few special guests with a hand-delivered invitation to your wedding. Hire a tuxedo-clad gentleman, send a singing telegram, or deliver with a bunch of gorgeous fresh flowers. Of course you probably can’t do this for every guest…but picking a special few will definitely leave a great impression! Think outside the envelope. An invite needs to inform your guests of what, when and where… and this doesn’t mean it must be on paper, in an envelope! Be creative and don’t be afraid to be different. Here are a few fun ideas to spark your creative juices: send a message in a bottle for a beach wedding, use a unique scroll invitation sent in a beautiful box, or make paper airplanes or kites out of your invites for an informal, outdoor summer wedding. 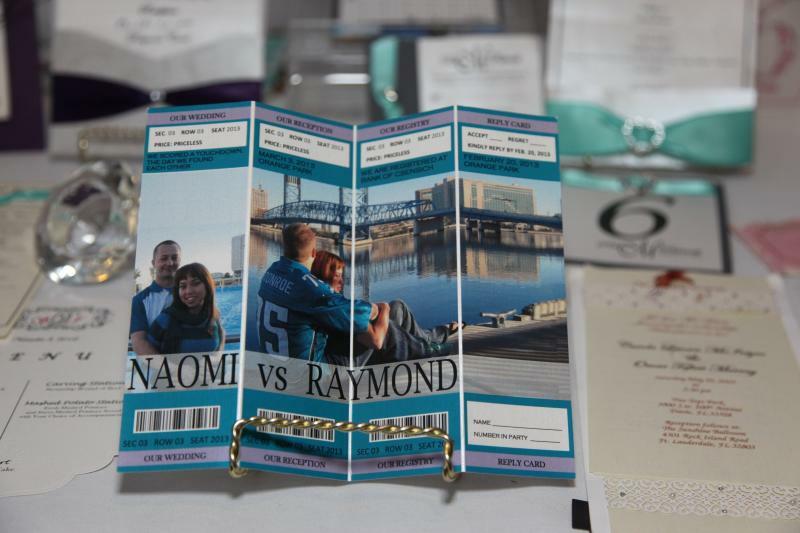 Think about a special activity or interest you share and get creative with your invitations! Calligraphy. Although traditional, you can never go wrong with using a calligrapher for your invites. Many calligraphers are thinking outside envelope and getting creative with their craft. And after you send out the invites…. Framing your wedding invite is a great way to add personalized “art” to your home while preserving those special memories, and including a mirror with it makes it practical and useful as well! Design Tips for a Great Wedding Booth! Make it easy for the bride, groom, friends and family to enter into your booth. Create a welcoming and interesting atmosphere giving them a reason to come in. Place the table at the back or side of the booth. If in a corner booth, place table on the inner side next to your neighbor. Don’t allow yourself or workers to stand or sit behind a table! Request a booth location that is right for your business. Some people like corners, some like being by the entrance, some like being behind a wall and some like being by the caterers serving food…learn what is best for you! 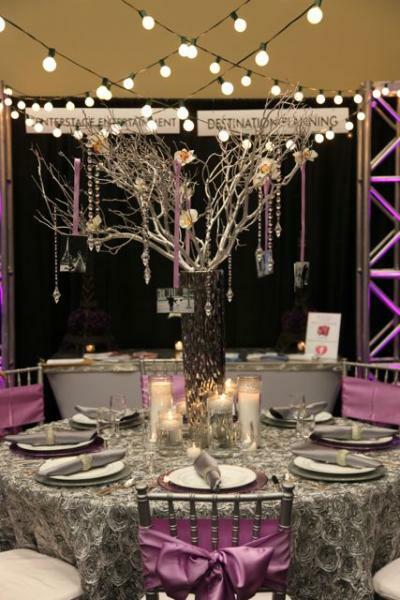 Try to have one focal item that brings all brides to your booth. If you need electricity, extra tables, more chairs – please let us know in advance. In some of our locations, electric is provided with the booth price and in other locations it is an additional charge. Many time we have to bring in additional tables (high tops and low boys) to accommodate the needs of vendors…reserve it weeks before the show because we might not be have what you need the day of the show. Remember to consider the pipe and drapery (the curtains separating the booth) when designing the booth. We typically have white, black, blue, or maroon depending on the theme of the show. However, we always allow vendors to bring your own. Please let us know if you plan on changing the supplied pipe and drape because we need to account for the extra pipe needed. Purchase curtains to create your own custom drape and look for your booth – we suggest that they be 96 inches plus to dust the floor. Do not clutter the booth. People are more comfortable in an open atmosphere. Have marketing material available for people to pick up. If possible, have your own registration at your booth coupled with a special prize or give-a-way. Each time you have a personal one on one conversation with the bride or the groom – make sure they sign your guest book. This will create your hot leads list of people you should follow up with! Utilize your logo and logo colors in your booth as much as possible. It is all about branding! Once you have purchased a booth for the upcoming expo…it is time to start thinking about the design of the booth. A great place to start, if you need help, is to follow the theme of the show. Some of the bridal expo themes have included; Moroccan Nights, Once Upon a Time, Nautical Romance, Midnight Masquerade, Love Birds, Southern Charm, Sea of Love, and many more! Each theme has a special logo and a color pallet that we follow. Booth requests are possible with our bridal show! When you are signing up, you can indicate a specific booth number or give a request to be on a corner, wall, or in another location. If you are designing a special booth, let us know if you need a special location because of the entrance to the booth or the walls. Also think about other factors like “Do you need electricity?” Many of our locations electric is included in the price of your booth, in some locations it is an additional charge. 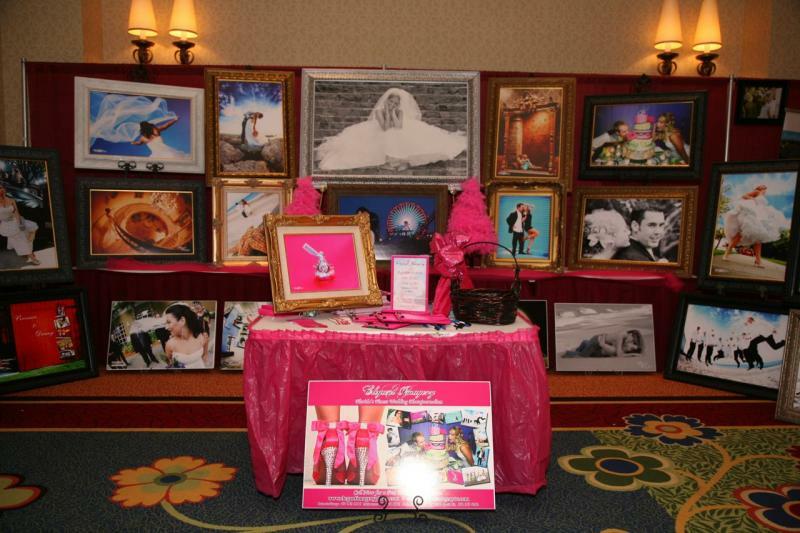 Remember, you want to decorate your booth so brides, grooms and her friends and family know exactly what you do. Make your booth a reflection of your business! Bring examples of what you do and try to display it in a creative way. Your goal is to attract the attention of the bride or groom and to make them want more information about your business! Below are some great booths….enjoy and good luck! Bridal Shows - Should I Particpate? It's true, not every wedding business is cute out to participate in a bridal show. The success of bridal show really depends on the personalities of people who are working the booth. Vendors need to be outgoing, friendly and welcoming to brides. If you love talking to people about your business and don’t have a problem speaking with strangers….then a bridal show is probably a great option for you! Many different wedding professionals participate in bridal shows because they are a cost effective way to reach your targeted wedding customer base. Most bridal shows will bring in hundreds of brides, friends, and family members. These brides are ready to plan their wedding in its entirety, which means they are ready to book your services. All brides are at different stages of their wedding planning – some just got engaged and others just need to book the last few wedding vendors. Because bridal expos are the best way to reach potential customers, it is imperative wedding vendors get as much as they can from the bridal fair experience. 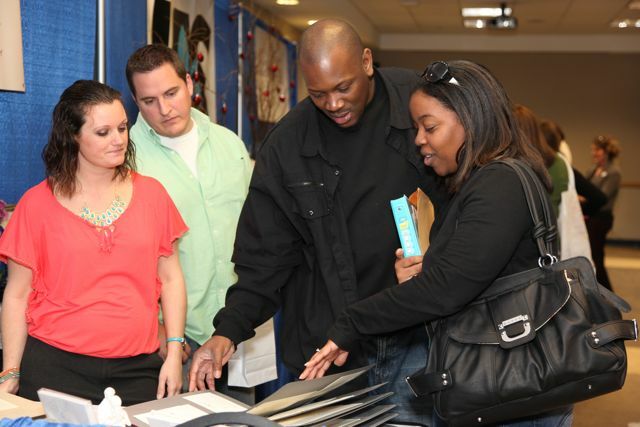 Types of vendors that participate in bridal shows; wedding venues or wedding reception locations, wedding photographers, bridal attire stores, grooms attire stores, wedding videographers, caterers, wedding officiates, wedding planners, décor and linen companies, videographers, DJ’s and musicians, rehearsal dinner locations, limos and transportation, makeup artists, cake bakers, florists, and much more! For those vendors who have not been to a bridal expo, here is a description. 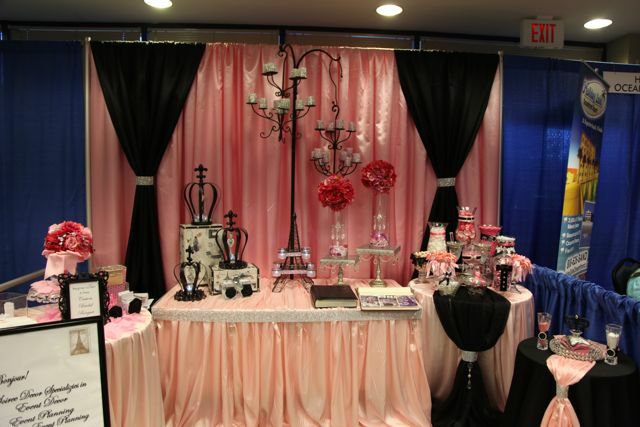 At most bridal expos vendors will rent a booth (usually 10x10 or 10x8 in some locations). The price for booths can range from $695 to $395 , depending on the location. Each expo has a theme where vendors are encouraged to participate in by decorating their booth or corresponding with the colors! 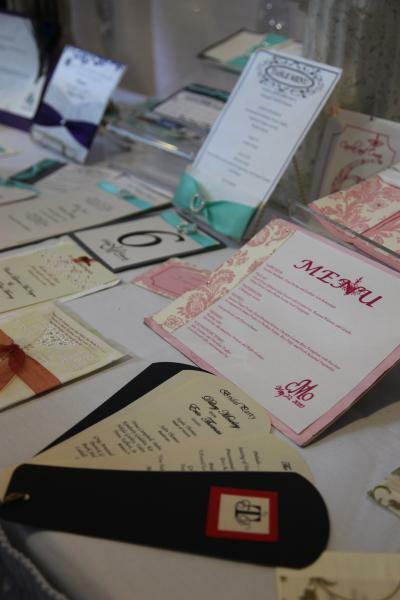 Vendors are encouraged to hand out information about their business and have a special prize at their booth that one or multiple brides can win. Brides love samples and give-a-ways so the more goodies you have for the brides the more traffic your booth will receive! We send out a great information packet to each new bridal show vendor giving them tips on how to have a successful bridal expo! Choosing your wedding colors sets the tone for the entire wedding....it is not just about the bridesmaid dresses but also the linens, flowers, decor, invitations and cake. Here are useful tips when picking your colors. Vibrant colors evoke a sense of drama where softer colors create a more romantic feel and earthy colors create a calming mood. Darker colors are associated with fall or winter wedding, lighter colors are in the spring and bright colors are in the summer. Analogous - 3 colors side by side on a 12-part color wheel. Like a darker orange, red and deep pink. Complementary - two colors which are directly opposite of each other on the color wheel to create maximum contrast like orange and blue. 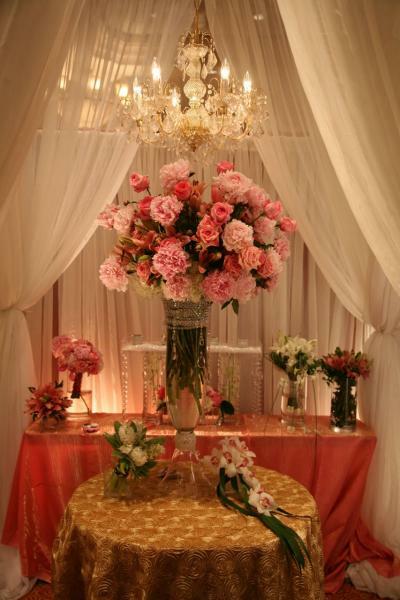 When selecting your color scheme, also think of your venues colors like the carpet, walls, drapes and the outside colors. The most popular wedding color is blue, with 30%, next is purple with 25% and the third most popular color is green with 24%. Every bride thinks about something old, something new, something borrowed, and something blue. Why not use your "something old" as the city you choose to get married in. If you live in the South, you are lucky to be surrounding by historic towns that make perfect wedding locations. Let us recommend that you explore the cities of St. Augustine Florida and Savannah Georgia for your wedding. Both St. Augustine and Savannah offer brides great backdrops for your guests to enjoy and pictures. Historic buildings, old oak trees, water ways all offer interesting backgrounds that your guests will enjoy and a good photographer can maximize on. If you are planning on a St. Augustine wedding venue consider looking at; The White Room, Marsh Creek Country Club, The Milano Room, Flagler College, The Lightner Museum, The Fountain of Youth, Seranata Beach Club or the Casa Monica. Now, if Savannah is more your style, think about checking out; 10 Dowing at Churchills, Andaz Savannah, Belfords, Bryson Hall, Grand Lakes Club at Southbridge, Hyatt Regency Savannah, Mansion on Forsyth Park, River Street Riverboat Company, Savannah Botanical Gardens, Savannah Marriott Riverfront, Savannah Station, The Mackey House, The Westin Savannah Harbor, Coastal Heritage Society, Marshal House and Telfair Museum….just to suggest a few. Choosing a wedding location sets the tone of the wedding and once it is picked, everything starts to fall into place.